Okay, not going to lie, I can not get enough of this placemat pattern. I keep thinking about different color combinations and layouts and just can’t stop making them. I’m still working with the 24/7 cotton yarn from Lion Brand. I just love how it works up with this pattern. It washes beautifully too. No fading, no shrinkage, nothing. The fall ones I did last year look as good as new. Right now I’m working on some patriotic ones for this summer. My plan is to put 3 or 4 stars in the blue section. I was thinking if they turn out cute enough I’ll enter them in the fair this fall. There doesn’t seem to be much of a crochet, or knit for that matter, showing at the fair lately. It’s all about the quilts. Then there is the Seahawks inspired one I’m working on for my daughter, it’ll be perfect for football season. She’d actually like some that match her color scheme but I don’t really like the color choices the 24/7 has, they don’t really match her color tones. I want to see if I can find another mercerized cotton yarn that will match her brown, red and cream colors better. A couple more “prototypes” for color arrangement and layout. I really love the black, grey, white and maroon one. Too bad it doesn’t go with anything in my house. I like the layout and love the color combination. The green and yellow one matches my dishes. I have an assortment of bright dishes and my thought is to make an assortment of placemats with similar colors so I can mix and match the placemats like I do my dishes. I’m not sure how I like the layout of the green and yellow one though, it’s just kind of blah. But guess it’ll be fine with my dishes. I really need to move on to something else though. 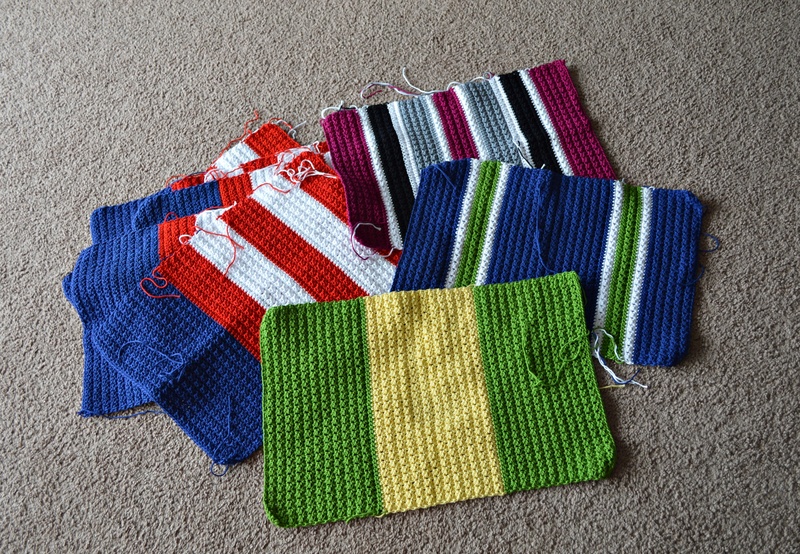 Ravelry has a challenge running, more for you to challenge yourself to finish projects I guess. So I challenged myself to finish 20 projects this year. As of right now I have three done so I need to get a move on.